The Flintstones: Dino to the Rescue was to be a 2D platformer based on The Flintstones license, developed by Tantalus Games and SWING! Entertainment, intended for release on the Game Boy Advance in the early 2000s. 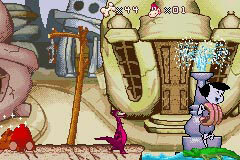 The player would take control of Dino, who must traverse his way through five worlds of varying settings, rescuing one member of the Flintstone or Rubble family at the end of each world. 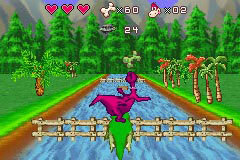 Along the way, the player can access bonus stages that have Dino either riding in a tortoiseshell or on the back of an alligator, making heavy use of a Mode 7 effect. In addition to Dino's versatile moveset which was said to consist of over 15 actions, the player can also make use of various items on their adventure, including a time-shifting buffalo horn and Bam-Bam's club. There isn't much known about the development of Dino to the Rescue, but what is known can be found in mentions of the game in interviews with developers at Tantalus Games, prior to Dino to the Rescue's cancellation. In an interview with planetgameboy.de, John Szoke of Tantalus Games states that "Normally, we should release "The Flintstones: Dino to the Rescue" soon. We completed this game before Top Gear Rally for Game Boy Advance, but we had some publisher issues. ", confirming that the game was indeed finished, likely around mid-late 2003 as the aforementioned Top Gear Rally was released for the GBA in October of that year. More importantly, however, is that according to this interview, it is implied that there were issues regarding getting a publisher to actually publish the game during development. It is possible that this could have led to the eventual cancellation of Dino to the Rescue, though whether or not that can be confirmed is currently unknown. In a later interview, found in Issue #1 of the Australian GamePro magazine, Tom Crago of Tantalus Games states that Dino to the Rescue "will come out [in 2004]", which seems to imply that the game was delayed at some point despite there being multiple known claims about Dino to the Rescue being a finished product at this point. Information on the game's origins and cancellation, in particular, are rather sparse; the game was supposed to launch somewhere between late 2002 to 2004, though the release period for the game would often vary depending on the source. In the end, Dino to the Rescue seems to have been silently cancelled without any actual explanation being provided. Though there doesn't seem to exist any gameplay footage of Dino to the Rescue whatsoever, a multitude of screenshots from nintendo-x2.com and Tantalus themselves, as well as a couple other images related to the game that were used on Tantalus Games' website are still available. No physical copies or ROM dumps of Dino to the Rescue are known to have resurfaced anywhere on the internet, and it is highly unlikely that anyone out there has claimed otherwise. If a copy does exist, then it is likely to be in the hands of someone who participated in the game's development. 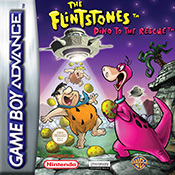 On May 27, 2008, No-Intro Forum user relax created a post subject titled GBA undumped and unreleased, with The Flintstones: Dino to the Rescue listed under the [Completely unreleased games] section. Since then, no documented attempts to acquire a playable build of the game have been made. Image used on Tantalus Games' website. The Flintstones and Rubbles being abducted in a cutscene. Dino exploring a snow-themed level. Dino in a forest-themed bonus stage.